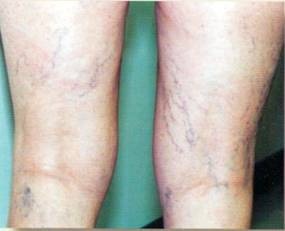 Spider veins (known as telangiectasias) in the lower extremities are the result of varicose veins with leaky or incompetent valves. 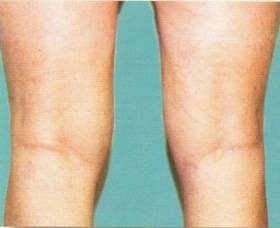 Patients generally suffer from venous insufficiency and can experience heaviness and swelling of the legs, ankles and feet. This condition can be hereditary or activity related. Jobs or activities requiring prolonged periods of standing or sitting in one place contribute to the condition. Left untreated, they can lead to permanent dark brown discoloration of the skin and ultimately venous stasis ulcerations. In the short term, this condition results in the creation of superficial blue colored spider veins that often create unsightly patches on the lower legs, ankles and feet. Other than wearing compression stockings at all times, very little can be done to permanently prevent these unsightly veins from arising. Depending on the location and the specific person, their presence can erode self-confidence and affect one's self-image. Often, young women will be embarrassed to wear shorts or skirts. Many treatments are available for this condition including laser, radiofrequency and injections. Lasers have not provided optimal results and can be painful. Previously saline injections were used which were not greatly effective and could cause superficial wounds. Dr. Zeetser has been using a type of sclerotherapy which is generally accepted to be the most safe and effective available today. The procedure is virtually painless. The amount of treatments necessary and the results depend on the individual and the size of the area affected, however improvement is typically seen relatively quickly. The specific details of the treatment will be discussed during your consultation. Don't be embarrassed by those unsightly spider veins any longer.